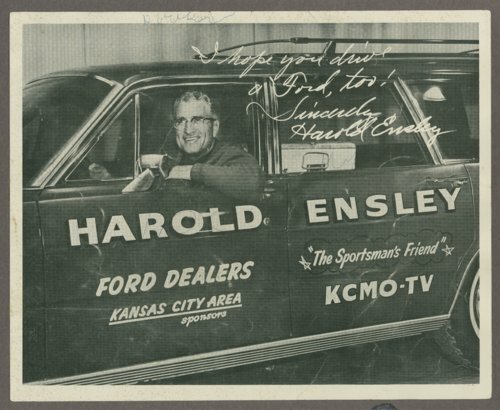 This is an autographed photograph of Harold Ensley, a radio and television personality best known for his television program The Sportsman's Friend. His innovative, nationally syndicated program was one of the first to feature fishing and hunting. It ran nonstop for 48 years. The photograph was taken as a promotional and advertising product for Ford dealers. There is a stamp on the back for Osage County Motors, Inc., 5th & Market Street, Osage City, Kansas.